Body parts that go bump in the Giro. 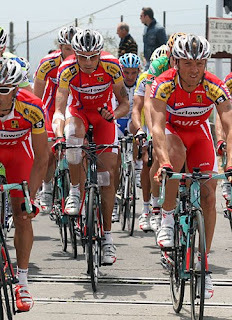 Stage 2 winner and points leader, Riccardo Ricco('The Cobra', Team Saunier Duval) fell with a group of twenty and limped home with a injured left finger. But, the most ominous physical trauma was directed to two CSC riders, Bradley McGee and Stuart O'Grady. They both sustained injuries to their collarbones and are out. Certainly, a slap in team CSC's face. Back on stage 2, climbing sensation Mauricio Soler(Barloworld) suffered major scrapes to his knees and elbow but got back into the race, with the help from teammates. Dave Zabriske(Slipstream-Chipotle) crashed heavily to the side of the road and it looked serious. The promising American, who looked so good in the team time trial, was a masked of pain as he was helped into an ambulance. 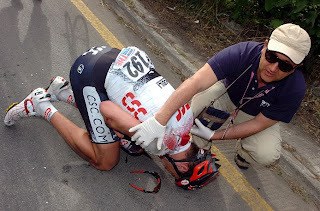 Damaging a vertebrate, he was pulled from the race and out of the Giro. "The early stages of Giro are always dangerous and the last few kilometers were very bad. I stayed near the front out of the trouble, but behind it must have been crazy," said stage 3 winner, Daniele Bennati. And it's only ... just begun! but his injured collarbone has something else to say! Colombian super climber, Mauricio Soler wrapped up for stage 3. (Top): Bradley McGee feeling the pain after breaking his collarbone. He was hit by another rider who swerved into him after missing a corner!